Tom Service visits Symphony Hall to ask conductor Mirga Grazinyte-Tyla about her ambitions for the CBSO and music education in Birmingham. Plus CBSO chief Stephen Maddock. 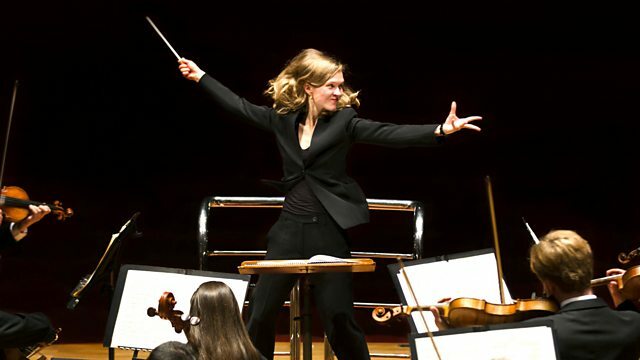 Tom Service asks conductor Mirga Gražinytė-Tyla about her plans for the City of Birmingham Orchestra, looks at the slave trade with composer Thierry Pécou, and explores the rarely-performed opera-oratorio, Le vin herbé. Tom visits Symphony Hall to talk to the exciting young conductor Mirga Gražinytė-Tyla about her ambitions for the City of Birmingham Symphony Orchestra and music education in Birmingham. He also discusses the challenges faced by the CBSO with Chief Executive Stephen Maddock following recent funding cuts from Birmingham City Council, plus an update from Julian Lloyd-Webber, Principal of the Birmingham Conservatoire, on the progress of their cutting-edge new building which is due to open its doors to students in September this year. Tom also talks to the French composer, Thierry Pécou, about Outre-mémoire, written for his friend, the pianist Alexandre Tharaud, which delves into the heavy history of the Carribbean island of Martinique and its slave trade, from where Pécou's own family is descended. Plus, as Welsh National Opera prepare to stage a performance of the rarely-performed opera-oratorio, Le vin herbé, Tom finds out why this work was pivotal in the compositional career of its creator, the Swiss composer Frank Martin, and puts forward a case for why we should hear more from this unique voice of 20th Century music. He talks to Nigel Simeone, who is an expert champion of Frank Martin's music, plus the director and conductor of Welsh National Opera's production of Le vin herbé, Polly Graham and James Southall.